I recently attended a panel workshop held by the Centre for Science and Policy at the University of Cambridge, and I wanted to summarize some of the things I learned in this Astrobite. I know, I know. “Policy” sounds complicated, and many scientists either don’t want to read about it or feel powerless when dealing with it. But science is done by humans, and policy affects all of us. That means that whether we like it or not, science and policy are inextricably related. Is it really this simple? Photo courtesy of Steve Rhodes, via Flickr. Before we go any further, let’s clarify a few things. This Astrobite is about science and policy, not politics. Politics—making decisions about how governments are run—directs the general direction of policy, but policy gets down to the nitty-gritty details of implementing those decisions. Policy makers, who are often civil servants rather than elected officials, don’t usually have control over politicians’ (often ideological) decisions. So what exactly is policy? As scientists, there are two main ways we can consider policy. 1) There’s “policy for science,” which is about how governments affect science. Governments that run scientific institutions (like the National Science Foundation in the United States, or the Science & Technology Facilities Council in the United Kingdom) have a say in how these institutions are organized and managed. This includes financial support: How do governments decide how much money to allocate to institutions for scientific research? In turn, how do these institutions award research grants? But governments can also affect other areas of science—as the American Astronomical Society notes on their Public Policy FAQ, governmental policies on education and land use both affect astronomy. 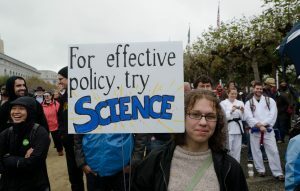 2) On the other hand, there’s also “science for policy,” the process by which scientific findings can lead to evidence-based governmental policy. For instance, if research suggests that certain pesticides cause bee populations to decline, the EU might vote to ban these pesticides. Sounds simple, right? In practice, turning scientific findings into actionable policies is messy and complicated (like science itself). In our bee case study, maybe only some bee species are in danger of extinction, or maybe this is largely the result of disease rather than pesticide usage. Maybe there’s a correlation between pesticide usage and bee population decline, but there’s not convincing evidence of a causal link. As we know, research rarely yields simple answers, and scientific literature is full of conflicting results—and policy makers often don’t have time to wait for more evidence. Furthermore, policy makers must often address multiple concerns. Banning a pesticide could also decrease crop yields, so maybe the economic benefits of using the pesticide actually outweigh the benefits of banning it. In the end, a nuanced approach must be taken—maybe some uses of certain pesticides on specific crops will be banned, but the pesticide can still be used on other crops like wheat (which isn’t attractive to bees). How can astronomers contribute to policy? Astronomers can contribute to “policy for science” in plenty of ways. Perhaps the most obvious method is to get directly involved in the administration of scientific institutions, but there are other ways to get involved, too. Public opinion should matter to politicians and policy makers on all levels, so outreach and educational initiatives that maintain public interest in astronomy can help ensure policies that support astronomy and science in general. Many people (including policy makers and children who could be future policy makers) may not fully understand what scientists actually do, so simply describing your work and your typical day to non-scientists can help affect policy changes. And of course, astronomers (like all citizens) can contact their government representatives in order to influence the overall direction of government policy. This can be done via normal communication channels, like calling or emailing, but it’s most effective if you develop a personal relationship with your elected officials or their staff. Universities and professional associations also often run webinars or visit days with government staff, so astronomers can advocate for science in person. The “science for policy” approach is a little more abstract for astronomers, since our research usually doesn’t have a direct impact on the daily lives of non-astronomers. However, astronomers can serve on expert panels that advise the government; on these panels, scientific training of any kind can be useful. At the workshop I attended, one of the panelists was a soft matter physicist by training. When she began taking on more policy-oriented roles, she found that although her soft matter physics skills weren’t pertinent to her work in policy, the skills she’d learned throughout her scientific career—reading literature, thinking critically, analyzing graphs and figures—were among the most helpful in advising policy makers about their available options. How specifically can students get involved in policy? Other than the suggestions listed in the previous section, there are plenty of opportunities for students to get directly involved with policy. Some of these opportunities are through structured positions, like internships. For students from the United States, the American Association for the Advancement of Science, the American Astronomical Society, and the Society of Physics Students all have policy internships, many of which involve working directly with members of Congress on Capitol Hill. There’s a similar Research Council Policy Internship for PhD students in the United Kingdom. This website contains excellent advice and resources for students searching for policy jobs or internships in Europe. This is not a complete list by any means, so if you know of any additional resources—especially if you are not from the US or Europe and there are similar resources for the country you live in—please write it in the comments. There are also other less-structured ways for students to be involved with policy. First, you can learn what issues are currently at stake for scientists. Read multiple news sources, or check out the editorial sections of journals. If you’re at a university, you can even try branching out of your department and talking to students in political science or public policy departments. If nothing else, you may make connections with future policy makers. Science outreach and education are also key, so consider volunteering for outreach events in your community. One of the panelists at the workshop told us that, as students, the best policy skill we can develop is learning how to present our research in an “engaging” way. So try writing about your work in a four-paragraph (or less) “executive summary,” and give it to your non-scientist friends! * Think about submitting a guest post to Astrobites, or applying to attend (next year’s) ComSciCon! *For a real challenge, you can even try writing about your work using the 1000 most common English words (trust me, it’s harder than it sounds). Finally, although so far I’ve mostly written about governmental policy, the truth is that other organizations (universities, professional organizations, etc.) are also administered by policies that directly affect students. If you’re interested in changing these policies, you can get directly involved within these organizations; you can be an active member of your undergraduate or graduate student union, or attend town hall meetings at large organizational conferences. I know we’re all busy with classes and research and life in general. It’s tough (and sometimes depressing) to think about policy when many of us just want to focus on the science. But policies ultimately shape the way we do astronomy, so it’s important for us to understand the basics of policy—and to learn how to shape it for ourselves.